Spring has arrived, the grass is turning green, flowers are blooming, birds are chirping and the Masters is right around the corner. Come out and enjoy the beautiful weather and golf course. 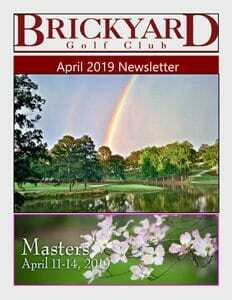 Please take time to see Briane Faletto’s golf course update in the newsletter. The newsletter highlights the results of the Toughman Tournament, the 2019 Hutch Cup schedule, the upcoming Sr. Club Championship, and the Saturday Morning Dogfights. If you have been looking for a group to play with, come out on Saturday mornings and Zac will get a game for you. Zac has arranged for three Demo days with Mizuno, Titleist and Taylor Made in April and May. Happy Hour Fridays, Saturday Morning Breakfast and Sunday Lunch Buffet will be held every Friday, Saturday and Sunday in April. The Club is closed on Easter Sunday. Be the first to keep up with club news and events by getting on our email list.